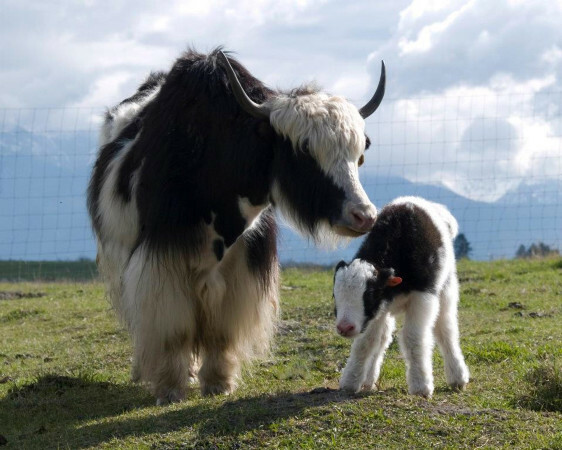 Yak and baby. Courtesy the International Yak Association. What’s shaggier than a horse, smarter than a cow, as lean as bison, and smoother-tasting than elk? I learned the answer recently through my local co-op: yak. Yes, the hardy ox-like animal we all associate with Mongolia. Yak are native to the Tibetan plateau, and here their meat was available in northern Indiana. I was fascinated. I enjoyed trying the ground meat, which my hubby made into a rich ragout. Then I read a mention in Midwest Living, too. Deputy travel editor Amanda Glazebrook had run across local yak on a restaurant menu in Minneapolis-St. Paul. Obviously, yak were being raised in multiple spots around the country. A visit to the source of my yak—Willow Pond Farm near Argos, Ind.—showed me why. Farmer John Haste is a full-time physician—but yak are so low-maintenance he is able to raise them on the side. And a growing number of U.S. farmers in the Midwest and on both coasts are acquiring yak, too. “There is a trend here,” he told me. Haste chose yak for their health benefits and keeps them because they’re easy-care. He puts out a mineral block they can lick and hay to supplement their grazing twice a week. And they’re so hardy, they prefer to spend snowy winters outside. Research and a series of interviews with International Yak Association leaders taught me more about yak. They’re nowhere near bison numbers of 220,000 nationally. But at an estimated 7,500 and growing, they’re being supplied to specialty restaurants, groceries, and butcher shops around the country. Could yak become the next bison? There’s lots more to know. Read my story for Modern Farmer here.